HeatMap Adaptive Pro - Best Responsive Google AdSense WordPress Theme. HeatMap AdAptive theme is inspired by Google AdSense placement recommendations that can be a multipurpose theme or an AdSense theme. It is a leading and very popular AdSense WordPress Theme. We are proud and happy to announce that heatmaptheme.com, is now part of WPEka Club Family ( All heatmap products and support experts are available on WPEka ). HeatMap AdAptive Pro Theme is one of the best themes for publishers and sellers. Google AdSense Responsive WordPress theme is a powerful theme which is monetized across multiple income streams to make advertising seamless. Fully responsive Google AdSense Optimized WordPress Theme ad units ensure that ads are display properly across all devices and screen sizes. The design of HeatMap AdAptive Pro is versatile, modern, responsive and user-friendly.HeatMap Adaptive Pro is fully responsive so you can enjoy live previews and apply custom made changes to specific mobile breakpoints. Google Advertisements are placed where there are most clicks and are completely blended with the content on your WordPress Site. And gives them a complete professional look. HeatMap Adaptive Pro AdSense Ready WordPress Theme ensures that you earn more. It has built-in solution which delivers responsive AdSense ads for mobile, tablet and desktop. Focus on advertising, generated more traffic and get maximum profit from your ads with HeatMap AdAptive Pro - Ads & AdSense Optimized WordPress Theme. Note : Use the HeatMap AdAptive Pro plugin to enhance the capabilities of HeatMap theme with more features. HeatMap AdAptive Pro plugin enhances the capabilities of HeatMap AdAptive theme by adding more features to it. 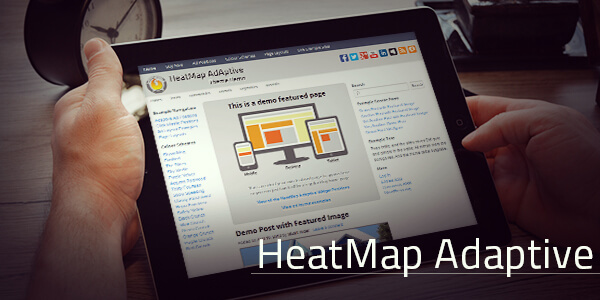 HeatMap is the best Responsive Google AdSense Optimized WordPress Theme out there - try it now. - layout-no-title.php simply removes the page title from the page - remember to put one in the page manually! * Remove heatmapthemead_comment () as it was not being used by the theme. * Added new widget positions blog post 1, blog post 2 and blog post 3 - these appear between the first three blog posts. * Removed HeatMap Adaptive ad widget dimensions to suit WP 3.8 widget manager responsiveness. * Added a border to images in layout options page to make them stand out on new WP 3.8 color scheme. * Styled CSS for INS tag for heatmap adaptive and cmam ads so that it no longer has the orange background when used in new asynchronous AdSense ads. * Added Russian translation - thanks, Dkost! * Rearranged logic of HeatMap RSS news feed. If for some reason the news feed is down now the News box will just not show. * Added CSS fix for responsive images in firefox when featured images are float left. * Removed enqueuing of jquery as WordPress automatically does that anyway. * Changed theme description to remove a link to heatmaptheme.com as its already in the author link. * Added code to ensure that widget position Post Inline, Post Inconter and Post Below do not repeat beyond the featured page or the first post on the home page. * Added additional option to allow text to flow around featured images (useful when images are smaller than the width of the theme. * Added CSS and extra body class so that when a mobile is detected by Click Missile the theme will fold sidebars beneath content (effectively making the content always full width) - this should allow the theme to still look good on 'widescreen mobiles'. * Changed logic of widget positions Post-Inline, Post-InContent, Post Bottom so that if the featured page is showing on the home page then ads will show on that. If it's not there then the ads will show on the first post. * Style UL and OL list in content to be always 'clear: left' so that they clear below any ads or images and still look neat. * Added code that switches off social.js when twitter like or google plus like is not ticked. * Change logic of HeatMap AdAptive widget so that when a page is set to front page it doesn't show ads for pages. * Added extra body class .heatmapthemead-reading-on-a-mobile when click missile is installed and detects a mobile. * Changed size of [Read More...] button and [Edit] button - made them larger / easier to notice. * Lots of Internet explorer fixes so that theme will work on horrible old Microsoft products. * Theme now includes response.min.js to for responsive ie8 and older. * Drop-down menus also will work properly with old ie versions. * added a margin below h2 through to h6 tags. It was a little too close to the content. * Created constants for all URLs in a theme that point to heatmaptheme.com for the user guide, upgrade page etc. Replaced hardcoded URLs. * Added Facebook Like and Twitter Follow buttons to upgrade message. * Added logic so that spacing beneath Page and Post headings remains consistent even when the page and post meta info is turned off. * Added a touch more top margin to social icons in the header, and changed the top and bottom margin at the 800px media query breakpoint. * Changed styling of sidebars when they responsively fold underneath the content to look a bit neater. * Removed underlining between content, primary sidebar, and secondary sidebar so the page flows better. * Added more hooks into the Widget position registration function. * Need to be able to name 'SECTION' and 'CATEGORY' menus for mobile - at the moment those titles are preset. * Drop down menus could be a little wider to make them a bit more practical in use. * When all 'meta' fields are switched off the gap between the post title and the text which follows is too small. * P tags for site title and taglines don't validate. - HTML validation errors in HGROUP spotted. * Noticed that comments form fields are getting cut off on a mobile phone. * bug in archive.php with featured images. Featured images are appearing before post title instead of after. * Miscellaneous 'core to WordPress' HTML validation errors spotted. * Need underline for links within .entry-content areas. It can be hard to see links sometimes so I think bringing back the good old underline in the content is called for. *Facebook script now does not get injected into the theme when FB button is not active. *Text site title and tagline are appearing on the header when the theme is first activated, with no way to turn it off. by default, only the default logo image should be showing.